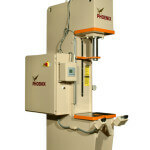 Phoenix Hydraulic Press delivered this 20 ton C frame press to a large auto manufacturer. The press, slide table and tool plate is being used in the production of bumpers for a new model vehicle. 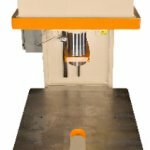 The press, which has 20 tons of punching force and 10 tons of opening force, includes a guided tool plate. The plate is 40” right to left and 32” front to back. Four guide rods with bushings were designed for the tool plate alignment. 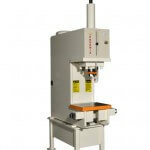 The press also has two air operated locking devices to hold the tool plate in full upright position. The slide table is capable of carrying 6,000 pounds. 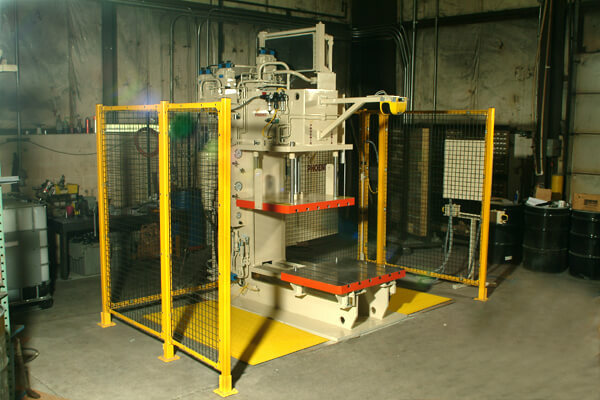 The slide table extends 18” to the front of the press to permit load and unload of the part. 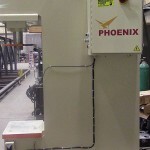 The press controls include an Omron NEIS series controller with an Omron Panel View, a Balluff position transducer (used for ram position), and 24 volt DC valves. The program involves a 2.5 “timeout”. Holding pressure for more than 2.5 seconds turns the press off. The operator control station is mounted on a safety fence outside the press area. 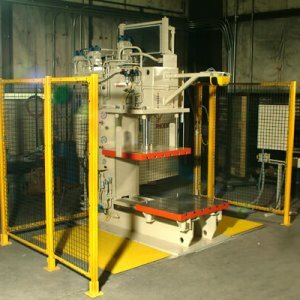 Safety features include light curtains mounted across the front of the press, a safety fence around the press and safety mats on the work area floor of the press.